The wonders of water: How is this chemical the key to life? water molecule is composed of just three atoms – one oxygen and two hydrogens. It is smaller than a molecule of carbon dioxide and, based on size, alone should float around as a gas at room temperature, but instead water molecules manage to hold together as a liquid. This remarkable feat is down to a phenomenon known as hydrogen bonding. The chemistry of water means that one side of the molecule is positively charged and the other side is negatively charged. When one molecule comes close to another, these charges attract forming a temporary attachment called a hydrogen bond. These sticky interactions are responsible for many of the amazing properties of water, including its ability to exist in all three states – solid, liquid and gas – under the range of temperatures and pressures that can be experienced on Earth. The temporary attachments between water molecules enable it to remain liquid over a range of at least 100 degrees Celsius (180 degrees Fahrenheit), or even more if the water is salty or under pressure. This means that Earth’s rivers and oceans remain stable even as the climate fluctuates. It is because water can freeze, thaw, evaporate and condense within the normal range of temperatures on Earth that we have our weather system. Water molecules can make up to four hydrogen bonds with their neighbours, but in liquid form this almost never happens. However, as water cools below zero degrees Celsius (32 degrees Fahrenheit), the molecules line up to form rigid crystals to maximise these bonds. This structure has lots of gaps, making it less dense than liquid water, causing the ice to float. This strange property is critical to the role of water in maintaining Earth’s climate, and in supporting life as we know it. If ice did not float, lakes would freeze from the bottom up, turning completely solid over the course of the winter. Water is also one of the best solvents in the known universe. The polar molecules can dissolve other charged particles, and even uncharged particles can be pulled into solution under the right conditions. This has many effects, from altering the geology of the planet to bringing biological molecules close enough for the chemistry of life to occur. Water is essential to life as we know it and as we have progressed on our watery world, we’ve harnessed its power to achieve incredible things. Water is made up of two key ingredients: hydrogen and oxygen. Each molecule contains one oxygen atom at the centre, bonded to two hydrogen atoms positioned 107.5 degrees apart. These key pieces of chemistry give water its unique properties. Oxygen is electronegative – it has a tendency to attract negatively charged electrons. This means that it tugs at the electrons belonging to the two hydrogen atoms in the molecule, and because the water molecule is bent it ends up positively charged on one side and negatively charged on the other. How It Works – What is water? More than half of your body is water and everything that happens inside you depends on it. Water is the solvent that enables vital biochemical processes to occur. It dissolves the chemical building blocks of life, preparing them for transport and construction. 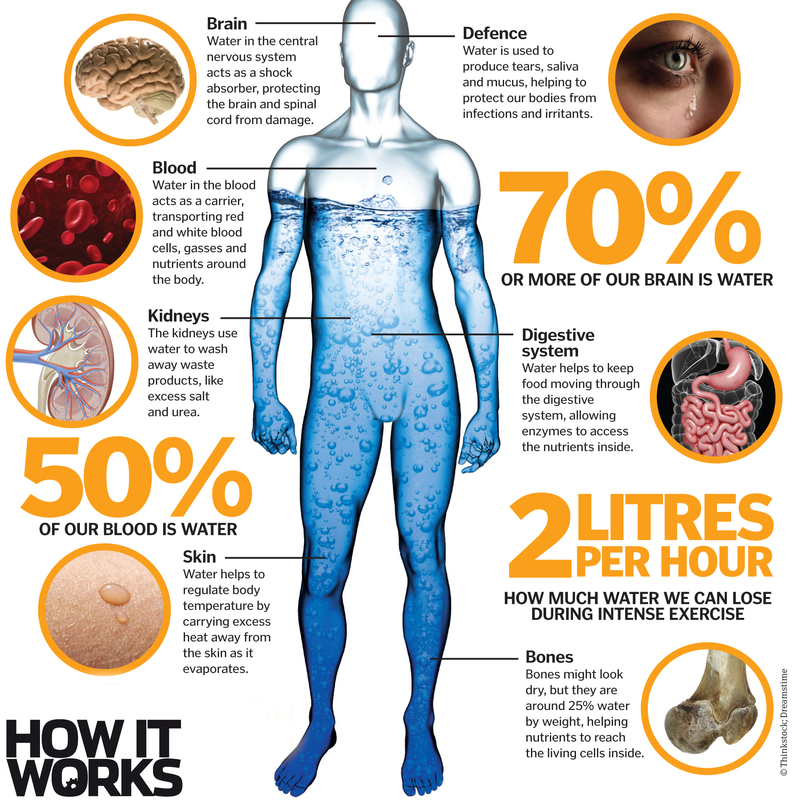 Without water, the body rapidly starts to malfunction. The effects are noticeable when just two per cent of total body water is lost, but if the amount drops to over 15 per cent, it can be fatal. With less water in the blood, the heart must work harder. Rising levels of salt cause muscles to spasm and water loss from the brain leads headaches, dizziness and confusion. Eventually, multiple organs start to fail. To find out more about the wonders of water, including how the water cycle works, how we use water in the home, and where water can be found in space, read the full article in Issue 76 of How It Works. Order it online from the ImagineShop, or, if you have a tablet or smartphone, you can also download the digital version onto your iOS or Android device. To make sure you never miss an issue of How It Works magazine, make sure you subscribe today! Earth’s water cycle: Why does it rain? At what temperature is water at its densest? Previous story How do slot machines work?